With the updated requirements of 5 hunts and 25 hours of hunting time, we had some pressure to get up there as much as possible. I have been up there several times since the season opener. Because of that, I’ve kept a pretty good pace to have no problem covering those requirements. Thanks to the new requirements, I’ve been able to put in the time, at the right times, to get my first bow buck! The new requirements have been both a blessing and a curse. Personally, I love the fact that I “have” to hunt a minimum of once a week for 5 hours at a time in order to continue to be eligible for the program. It has however put a bit of a strain on the home life. My wife has been very understanding with all of my time on stand this season. All of my time on stand has also meant limited time for her. She is going to have to put a lot of time in over the next couple of weeks to remain eligible. With 2 deer down already, I was really only looking to take a doe. Well, to be honest I would have definitely taken a big buck, a true first bow buck. I was looking to redeem myself from the button buck shot during my first sit of the year. There was a South/Southwest wind. I had learned that although it was close to being a good wind, it was far from perfect. The perfect wind for that stand would have been a Southeast wind. In this area, a Southeast wind is pretty rare. The day’s high was 45, a good 16 degrees below the average high for this time of year. The hunt turned out pretty well. I saw several deer. This was also the hunt that I learned that a Southwest wind was not going to be the best option. As I saw the first deer coming over the hill towards me, I knew that she would end up right in my shooting lane somewhere between 25 and 30 yards. When she stopped, I kept watching. I had no idea what she was doing. She wasn’t browsing, wasn’t sniffing the air or staring off in one direction. I was confused. I thought she was alone. After several minutes, I noticed the flick of a tail just in front of her. There were 2! As they just stood there for several minutes, I watched intently. I was ready to pull back if or when she ever decided to continue down the trail. While watching the 2 deer on the hill, I kept checking back in to the different possible shooting lanes visualizing the shot. One of those times, I turned to look and there stood a 3rd doe. She was already in my 35 yard lane quartering towards me and still moving. She was slowly sneaking through, completely on edge. I knew that she had smelled me. As she continued up the trail back towards the other 2 deer, she maintained constant movement and was always quartering towards me. That was just not a shot that I wanted to take. Once in the woods, she took the other 2 deer with her around the bend back towards my downwind side and out of sight. I was disappointed as I heard them scamper off. The never blew. They never totally busted me, but they knew that something wasn’t right. They weren’t willing to take the risk. About 20 minutes later I saw them come back by farther down wind of me and continue through the funnel without a worry in the world. A few minutes after that, a 1 1/2 year old buck came through another 30 yard shooting lane upwind of me. Absolutely could have harvested that deer if I had wanted to. Another successful hunt! Surprise Hunt Leads To My First Bow Buck! My wife was supposed to be hunting that Thursday. But, because we were leaving the next day after work to head down south, she decided not to. Normally I would have just said okay and gotten ready myself. But the wind though was out of the Southeast. A rare wind that is literally the perfect wind direction for that stand I had had the encounter in with the does the previous weekend. With a determination to take a doe there, I headed to the stand straight from work. I parked where I had a farther walk but my scent would never come close to intersecting deer until after they had gone through all of my shooting lanes, if ever. I was extremely excited, yet worried that I had already missed the doe group moving through. Because this is public land, there is a possibility of random people walking through. That’s just the way it goes. Usually, that doesn’t happen in the zone I was assigned because there aren’t any trails that are setup. Limestone path or otherwise. The only thing was a mowed path leading from our other parking spot closer to where the public can park. It didn’t help that it was right off the limestone path. Anyway, the member of the public came walking straight down that path around 5 O’clock. I had only been in the stand for about a half an hour. Immediately, I hid behind the tree as I watched the man walk along. As he stopped to look down the path that led in to the marsh, I was relieved to see him decide to continue along the edge. If he had walked down that path, he most likely would have ended up seeing me as he stood at the edge of the water. Instead, he walked around the bend as close to the woods as he could get without getting wet. As soon as he was out of sight, I started to relax again. Even though I have permission to be there, you just never know how people are going to react. My relief disappeared as quickly as it came on. It was about that time that I realized that the man had only 2 options once he got about 100 yards around the bend. He either had to turn around and come back the way he came, or he had to enter the woods, walking basically straight through the middle of them. Either way, my hunt was basically over. If he decided to walk through the woods, he was going to give me an accidental deer drive. This was both good and bad. The good was that the most likely escape route was right past me. The bad was that if I didn’t see any deer within the next 10-15 minutes, my night was basically over. If he decided to turn around and come back the way he came, he would again be walking past me during that final 30 minutes of light. No matter how you slice it, that option was just bad. Within about 10 minutes, I began to watch intently in the direction he had went to watch for him coming back. He never came. About 20 minutes after I last saw him, I knew that he had decided to walk through the woods rather than come back the way he came. I had failed to take in to consideration that he could have stopped to look at something or watch something. So I continued focusing on the direction he had went while still glancing back the other direction every once in a while just in case. Finally, My First Bow Buck? As luck would have it, one of the times I glanced back, there was a buck sneaking through. Not only was he a buck, he was one that I immediately knew was one I wanted to shoot. He quickly snuck through the brush along a trail leading to my shooting lane. All in one motion, I grabbed my bow, raised it up and drew back. I gave a quick grunt and he halted on a dime, right in the middle of my shooting lane. I settled the pin and let the arrow fly. From the time I spotted the buck to the time I took the shot was less than 10 seconds. The amount of times I’ve heard someone say “it just happened so fast! All of a sudden he was right there!” is uncountable. Personally, I’ve never been in that situation until this night. It happened so fast that there was no way that I would have been able to make that happen if I had been able to be filming. I saw my arrow hit exactly where I was aiming, 30 yards away. The buck turned and ran back the way he had come with the arrow and lighted nock looking as though it had not penetrated as far as I would have liked. I had definitely not gotten enough penetration to create an exit wound. The angle of the shot combined with the lack of exit hole told me immediately that if I didn’t see him go down, I might be in for a long track. The buck slowly bounded over the hill and out of sight in total shock. I had just taken my first shot ever at a true buck. 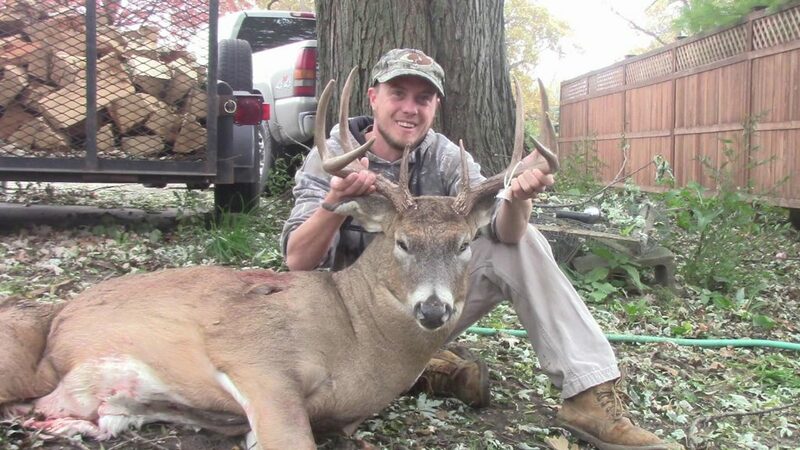 I have purposely been waiting to take my first bow buck until I found one that I had no doubt about shooting. It took several years to take that shot and I did not have the confidence that I wish I had in that shot. True to my fears, I found very little blood. It took 10 yards from point of impact to find the first blood. After that, another 10 yards. After that, I couldn’t find anything at all. I decided to walk up to the pinch point area that he had to go through and got down on my hands and knees to find a single drop of blood. After that, I found a few more within a few yards and I began to think that things would get easier. Boy was I wrong. Rather than make this story in to a novel, I’ll keep it brief. I ended up tracking the buck for about 100 to 150 yards from the point of impact. I lost blood more times than I could count and found it again several times walking down the trail that I thought he took. Just before I found the back half of my arrow, the batteries in my flashlight died. After finding my arrow right next to a human walking trail, I was unsure of which way the buck would have gone. It was then (after 9:30 pm) that my wife informed me that both of my children were refusing to go to bed until I got home. Feeling defeated, I headed back to my truck to in search of extra batteries. I wasn’t ready to give up for the night. The area is known for a lot of coyotes so I knew that if I had to leave him overnight, there was a good chance that the coyotes would find him first. Upon getting to my truck, I found no spare batteries along with all of my backup flashlights also dead. It was time for me to head home. For the rest of the story regarding my first bow buck, check out the video below.